I am so honored to be part of this wonderful memorial tribute to Judy VanAlstyne, commissioned by the Bill Naito Company in Portland. The memorial was designed by Mary Galluzzo Design and written by Janet Gonrowski. 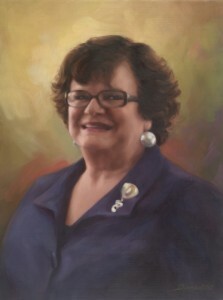 And I was fortunate enough to get to know Judy during my month long process of painting her. Judy served the Bill Naito Co. for 24 years as property manager, and was known and revered for her dedication to Portland’s downtown and Old Town. She was a mentor, a strong supporter of women in business, and she was a key team member responsible for bringing City Target to downtown Portland. So it is only fitting that Judy’s memorial is permanently exhibited in the Galleria Building in Portland.